It was first published in 2000 and since 2018 using Open Journal System (OJS) as submission system. Editors accept submissions of the well-prepared manuscript that have not been published in other publications. The manuscript format and requirements are listed on the back cover page. Incoming papers will be evaluated and edited for the uniformity of arrangements, terms, and other writing procedures. 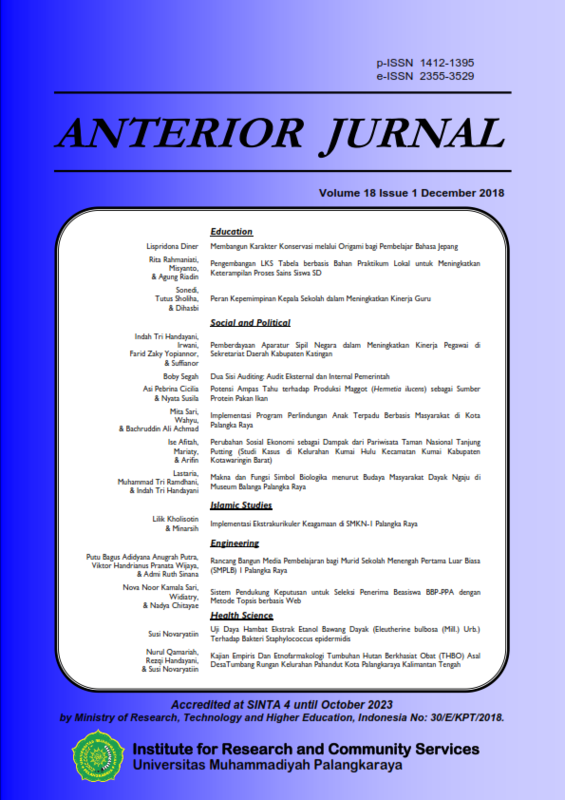 Every year, Anterior Jurnal publishes between 24 and 28 articles divided into two issues. The Copyright article is given to authors without any restrictions. Authors are also allowed to retain publishing rights without restrictions. 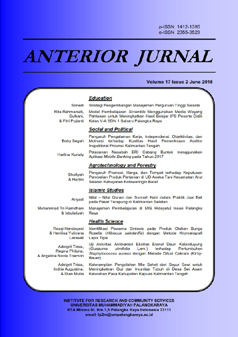 Starting from Volume 18 Number 2 June 2019 edition, Anterior Jurnal makes changes to the template in the article that will be published. The change aims to make it easier for readers to observe important parts of each page of the article. The latest article format can be downloaded in the Templates section. The publication of Anterior Jurnal indeed participates in disseminating the results of research and review of science and technology development conducted by lecturers and researchers especially from UM Palangkaraya and other universities. This edition contains 14 articles consisting of Education, Social and Political, Islamic Studies, Engineering, and Health Science topics.